I just read the story of the Harlingen dogs, sent out by Jennifer Watkins of Shamrock in Louisville, Kentucky. Shamrock took 4 of these dogs. My husband and I agreed to foster Ocho from this group, our first (and unexpectedly last!) foster dog. My husband fell in love with her instantly and when Shamrock emailed me to say they had a potential home, he was on the phone to me in 20 minutes asking how I felt about keeping her. We have 3 other Greys and had NO intention of adopting number 4, but we loved Ocho from the moment we set eyes on her, and we just couldn't let her go. Thank you, thank you for what you did for these dogs, and for bringing this sweet girl into our lives. 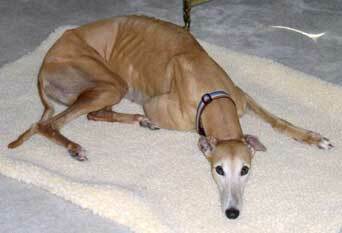 She has a greyt forever home with 3 Greyhound sisters, 3 cats, and much love.